I had 0 plans for the weekend (I know, boring). Sitting at my desk at work, my eyes watering from staring at the computer screen, I waited for the clock to strike 5pm. My phone was blinging with Facebook messages – friends asking what my weekend plans were. Then, somehow, the plans were made. We were headed to Masons Falls – just like that! Saturday morning was cool, but sunny. My friend Roya arrived at my house and soon after our friend Scott knocked on the door. Luckily, Scott has a car, so after picking up warm coffees, we were on our way out of the city. Turn right onto State Route 43/Citylink ramp to Bendigo/Airport/Hume Hwy (this is a partial toll road. If you’re unsure about toll roads in Melbourne, check here). You’ll then reach the picnic area – turn left and left again (the carpark is one way) and you’re there! Stepping out of the car at Kinglake, the air was significantly colder than the city. Surrounded by tall, thin trees with the sun shining through, it was a beautiful spot to begin. There is a big carpark area and plenty of facilities here including toilets, picnic tables and barbecues. There’s also plenty of information about the history of the area and the wildlife. In 2009, menacing fires known as the Black Saturday fires ripped through this area, and the recovery process is still clear. Which way to go? It’s pretty self-explanatory. Always remember to be respectful of the wildlife. The day we visited, fog clung to the ground, dispersing into the air. We shivered, passing the picnic tables and beginning on the path to the falls. There are lots of other walking trails around the Kinglake area. We took the left trail to Masons Falls (obviously). If you’re interested in more trekking, there’s some info here. The track to Mason’s Falls begins flat and muddy, so bring proper footwear. I had chosen my falling-to-pieces Nike free runs, which wasn’t the smartest decision I’ve ever made. My Kathmandu hiking boots* would have been a far better choice, though this path is relatively flat and easy, so you could get by with sneakers. And actually I managed with my Nikes in the end. Along the track you get a peak at the view, with huge undulating hills. Large trees not yet recovered from the fire that ripped through the area reach tall into the sky. After crossing a bridge, the track heads slightly uphill before reaching the amphitheatre-type viewing platform. Only 700 meters from the carpark, this walk is perfect for families and those who aren’t eager hikers. The viewing platform pokes out over the hill and showcases Masons Falls. Though we were quite a distance away, so these photos don’t do the falls justice. They plunged quite drastically into a hidden gorge below. In addition to that, lack of recent rainfall meant that they weren’t as full and flowing as I’m sure they are during the wetter months. (This visit was in June on the cusp of July, prior to any significant rain). The below photo gives an indication of the distance between the platform and the falls. I was playing with my zoom lens (a 55mm-300mm), which explains the closer shots. The sunlight was also posing a slight issue for long exposure shots. But we couldn’t complain about the glorious day we were experiencing. We decided to head back and explore the beginning of the stream that fuels Masons Falls. Back near the beginning of the track, a small bridge provides sneak peaks of this area. We had to climb off the track to get here, so take care if you plan on doing the same. As you can see, the stream was quite dry. If it was in full flow, we may not have been able to stand here. The sunlight trickled through the trees, sparkling on the little pools of water. Much to my pleasure, this area gave me an opportunity to play around with some long exposure shots of the water that trickled among the ferns. We spent some time here, where it was peaceful and pretty. I set up my tripod and played around with a few angles while Scott and Roya stood and watched me patiently. I always admire people who accompany me on my waterfall trips for being so patient. I have a tendency to be rather annoying when it comes to taking photos. But hey, it’s what I love. I jumped down a rock-face a little further downstream and found this section, which was probably the best flowing in the whole area. Finally, I put Scott and Roya out of their misery and decided it was time to leave. Though our adventure wasn’t over. Nearby Masons Falls (you can actually take the 9km trail there and back if you’re a budding hiker) is Sugarloaf. We opted for being lazy, and drove up to Sugarloaf to see the view of Melbourne, which was pretty incredible. I would highly recommend doing this if you’re in the area. After gazing at the view and snapping a few shots, we headed back to the car, munching on salt and vinegar crisps. It was still early, so we decided to head to the nearby Wombelano Falls (15 minutes further East). Head there with us! Looking for other waterfall adventures in Melbourne, Victoria? 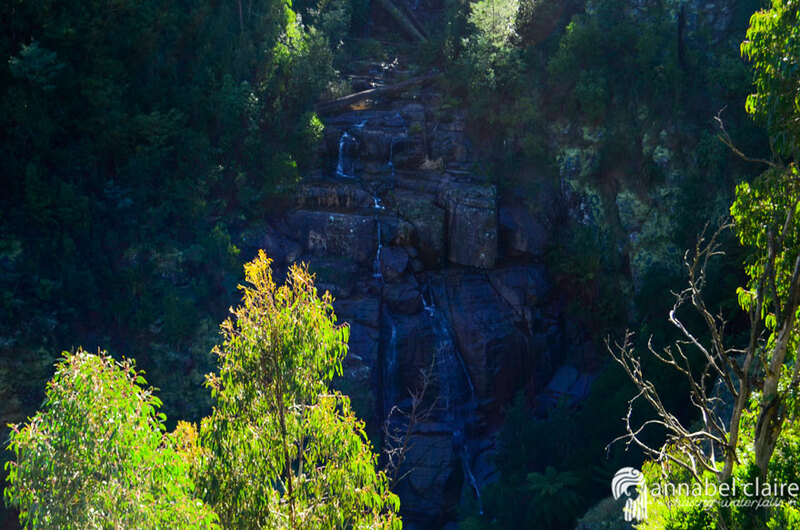 Try Olinda Falls in the Dandenong Ranges!